We are back this week with another Pokémon Anime Daily! In this week’s episode some major story unfolds and we get the introduction of several new characters! 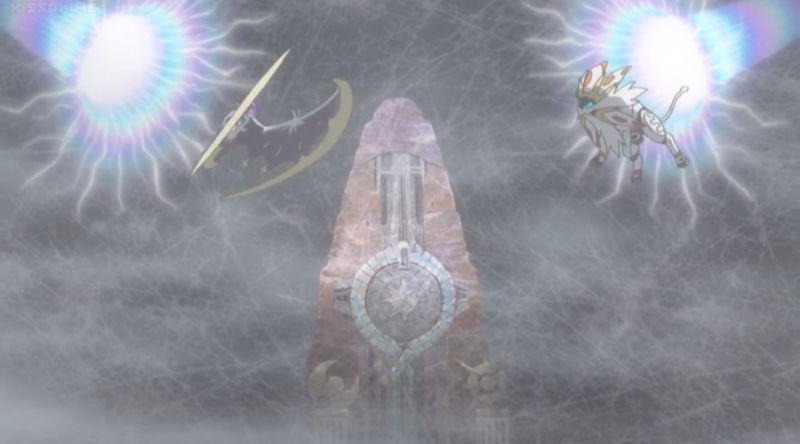 The episode opens up with Ash having a dream where he is at the Altar of the Sun and sees Solgaleo and Lunala emerge from an worm hole. They stare at Ash and he promises them something. We then see Cosmog appear as the scene shifts showing all the island guardians. Ash’s dream ends and we see the scene change to show Gladion. Gladion is in a cave somewhere trying to prevent Type: Null from going outside because he fears it can’t be shown to the world.  Type: Null tries to fight it, but eventually listens to Gladion. They hear something and Gladion remarks “Is that an Ultra Beast?” Once again the scene changes and we see Rotom tries to get Ash up. Nothing is working until Litten slaps Ash awake with its tail. Ash finally wakes up and begins to get ready for school, contemplating the dream he just had and what it means. While eating breakfast, Rotom puts on the news and we learn that Professor Burnet has won the Alola Shining Ladies award for her outstanding research and contribution to the region. Kukui is caught off guard to see his fellow researcher but recognizes that she deserves it. Ash asks Kukui how he knows her, and he informs Ash that Burnet is a fellow researcher whom he has known for some time now. Rotom asks what she is researching and Kukui tells them: Ultra Wormholes. Ash is curious as to what this is, but Kukui promises to tell him at another time. The scene changes and this time we see the Altar of the Sun in person! 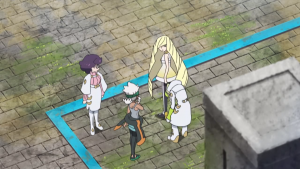 Here Lusamine is shown to be researching the ruins with Faba, Burnet and Wicke. Lusamine is trying to piece together the battle that was fought here between the guardians of Alola and the Ultra Beasts, while also trying to find the causes for a spike in Ultra Energy. Burnet believes an Ultra Beast is behind it but Faba remarks how there’s no readings here now unlike last night and suggests Burnet’s equipment malfunctioned. Lusamine corrects him however, saying he only reached this conclusion out of jealousy. They all decide to look around some more as the radar picks up more energy, undetected by Faba. The true Ultra Recon Squad? We then see that Ash is on his way to school when Tapu Koko flies overhead and gets Pikachu to follow it into the woods, causing Ash to run after it. Ash and Rotom see Tapu Koko but it flies off. Ash looks down at where Tapu Koko was and notices Cosmog, the Pokémon from his dreams! 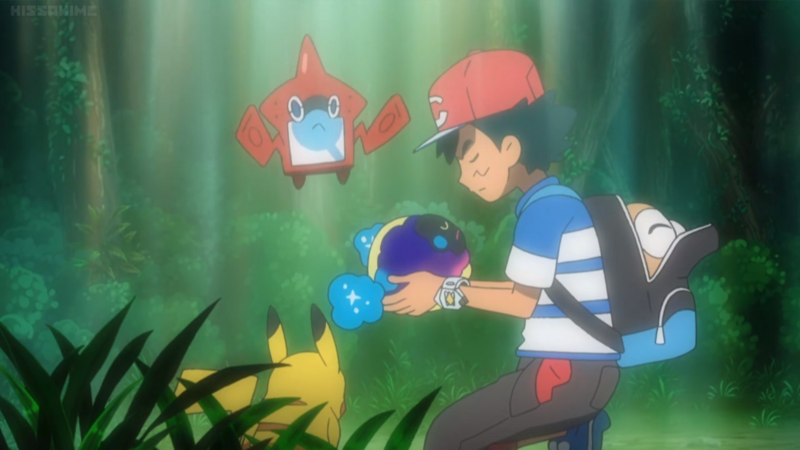 Ash recognizes this and remembers his promise to take care of it. Cosmog is sleeping and Rotom decides to see what Pokémon it is, however it has no data on it, which shocks Ash. Everyone at school is wondering where Ash is, when he runs in freaking out over finding an undiscovered Pokémon. He asks Kukui and Principal Oak if they know what it is, but neither have seen anything like it before. Not even Lillie’s books have information on it. This leads them to decide on what to call it, and Lillie suggests Nebby, due to it looking like a nebula. Ash understands why that makes sense and agrees that it would be a great name for it. Nebby then wakes up and begins crying very loud and no one can calm it down, until finally Mallow succeeds. With Nebby happy, they try to figure out what it eats so they can keep it healthy. Everyone puts together different Pokémon food dishes, but Nebby doesn’t want any of it. Sophocles then has an idea and pulls out a candy called Sugar Stars. This catches Nebby’s eye and it begins to eat them. Sophocles shows Ash where to buy these on the way home from school so that they can keep Nebby happy. Meanwhile Burnet has picked up another Ultra Energy reading, this time on Melemele Island! Lusamine decides that they should all report to there right away and check it out. By the time Ash and Lillie arrive at Kukui’s house, we learn that Lusamine has arrived and is waiting for them there. Lillie is shocked to see her mother here and a bit upset. Lusamine remarks how big Lillie has gotten and how glad she is to see her daughter again. 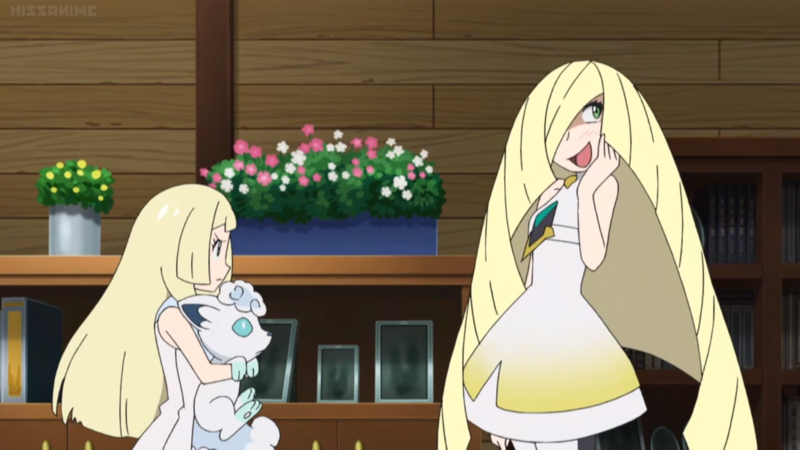 Lillie says that she’s embarrassing her and then Lusamine notices Lillie is holding Snowy. Lusamine is happy to see Lillie able to touch Pokémon again and begins to tear up, saying how much she has grown. Lillie doesn’t want her to comment on her owning a Pokémon because the last one she had was forced to evolve by Lusamine. Lusamine remarks that Clefairy was hers and that it’s only natural for them to evolve as they get stronger and that Lillie’s reasoning that it was cuter as Clefairy is illogical. After talking to Lillie, Lusamine introduces herself and everyone else from Aether to Ash and then asks to see Nebby. Ash agrees and shows her, and Lusamine remarks how this one really is an Ultra Beast. Ash asks what an Ultra Beast is and Lusamine tells them the legends surrounding them in Alola, as does Lillie who had read about them. Lusamine and Lillie finally meet! Burnet then mentions the energy readings they detected and shows the Altar of the Sun, which Ash recognizes. He tells everyone about his dream and how Cosmog appeared in it. Everyone is surprised to hear Ash mention Solgaleo and Lunala. Lusamine then asks Ash if he would leave Nebby in the care of Aether. Ash tells Lusamine that he made a promise to take care of Nebby and that’s what he will do. Faba says an Ultra Beast is much too strong for a child to handle, but Lillie assures everyone that Ash is a strong trainer who has received a Z-Ring from Tapu Koko and Kukui mentions how Ash has also cleared the first two Grand Trials. 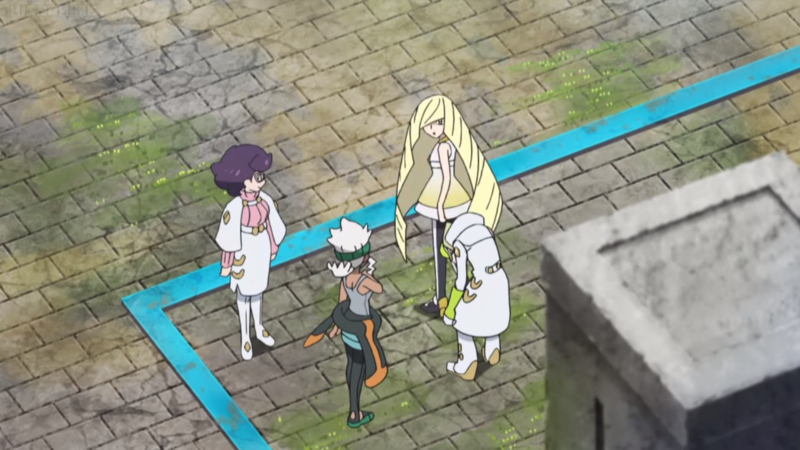 Much to Faba’s dismay, Lusamine agrees to let Ash keep Nebby and says she wants to learn why he was entrusted with Nebby. She tells him that if he ever needs anything, not to hesitate to ask, and the episode ends. Be sure to join us next time, as more about Nebby is learned! What did you think of the episode? Are excited for upcoming episodes?